Application Available for various heating treatment, melting, forging, welding, brazing, hardening, etc. 1) It has wide frequency range from 1KHZ to 20KHZ, which can be adjusted according to the specific size of the workpiece or the depth of heating, with large range of adaptation. 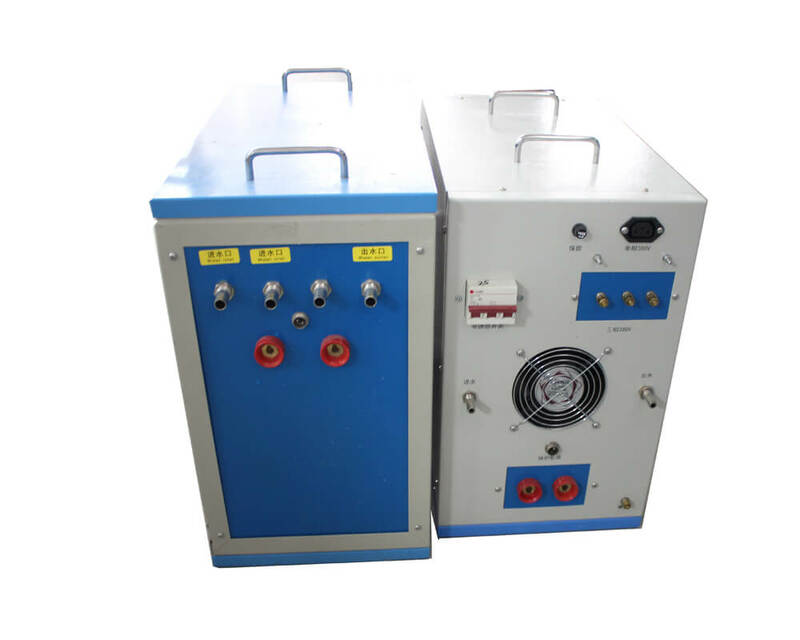 Considering the melting capacity, electromagnetic stirring, heating efficiency, noise and other factors to design an induction loop and matching compensation capacitor so that to determine the size of the output frequency. 2) With traditional medium frequency parallel-oscillating structure, it is simple load matching, high efficiency and high utilization of equipment. 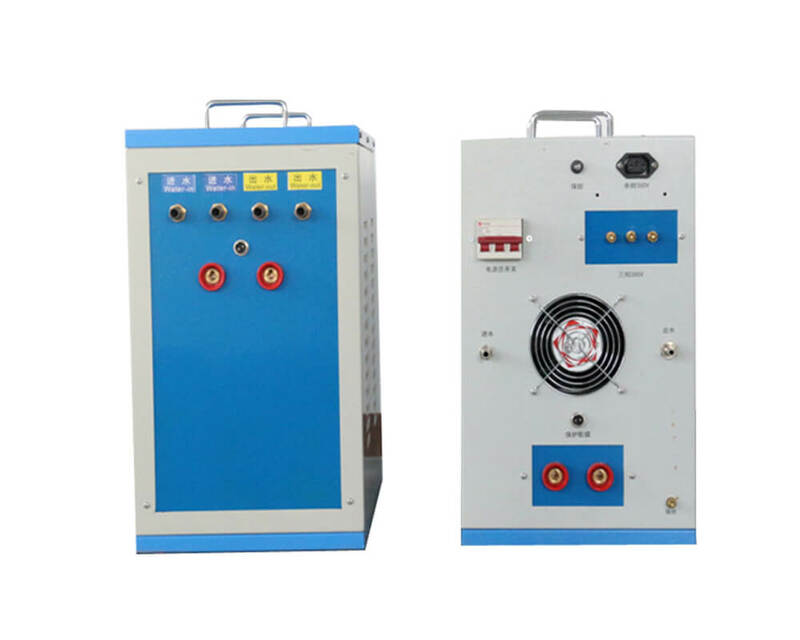 3) Reverse process, which makes reliability increased greatly under the state of large power, and which makes the device developed greatly in high-power field so that to realize the 100% load. 4) High efficiency energy-saving: with the whole power range, high power factor and power efficiency, compare to silicon controlled medium frequency, it can save at least 20% energy. 5) Small size, light weight, completed models, and there is a large range to choose. It not only can be used in industrial production, but also available in small melting test in school institute. 6) Commonly used for melting steel, stainless steel, copper, gold, silver and other materials. There is a wide range of melting capacity, from a few kilograms to hundreds of kilograms. It not only can be used in industrial production, but also available in small melting in school insitute. 7) Medium Frequency melting furnace has a good performance in electromagnetic stirring, which can evenly melting the metal in temperature and structure aspect. It is conducive to scum, reduce impurities. 8) Compare to silicon controlled medium frequency, it can save at least 20% energy. Induction heating is the process of heating an electrically conducting object (usually a metal) by electromagnetic induction, through heat generated in the object by eddy currents (also called Foucault currents). While an induction heater consists of an electromagnet, and an electronic oscillator that passes a high-frequency alternating current (AC) through the electromagnet. The rapidly alternating magnetic field penetrates the object and generating electric currents inside the conductor called eddy currents. The basic component of an induction heating system is an AC power supply, induction coil and workpiece (material to be heated or treated). The power supply sends alternating current through the coil, generating a magnetic field. Hence when we place the workpiece in the coil, the magnetic field induces eddy current in the workpiece. Therefore generating precise amounts of clean and localized heat, which without any physical contact between the coil and the workpiece. Heat Treatment (surface hardening, quenching, annealing, tempering). Hardening parts of automobile, motorbike, mold and agricultural machinery. 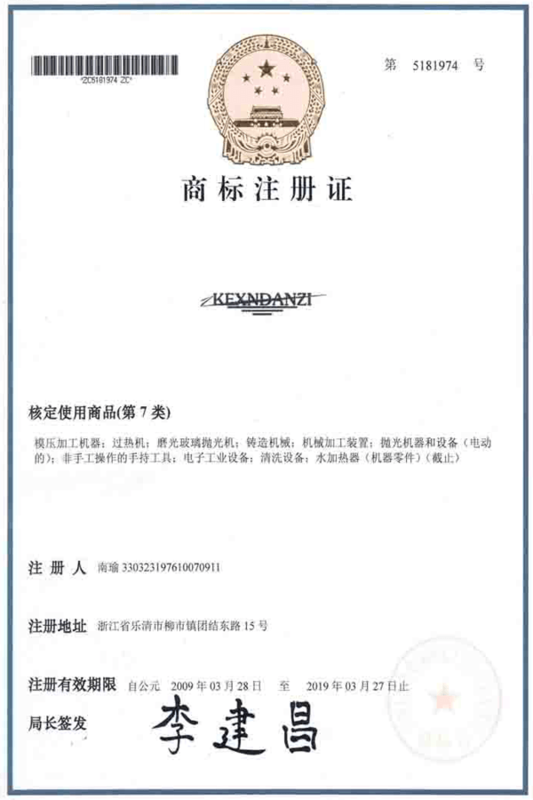 Quenching machinery parts, such as: all kinds of gear wheel and chain wheel. Industrial of machine tool hardening, such as bed guide way of machine tool. Heat treatment for pliers, spanner, screwdriver, drill, axes and spiker. Various metal work pieces annealing, such as golf ball head, brass lock, hardware copper fitting, kitchen knife handle, blade, pan and pail. Non-ferrous and ferrous metals melting. Precious metal melting, like gold, sliver and platinum, etc. Specialized steel, iron and copper melting. Metal alloy melting, like aluminum alloy, zinc alloy and copper alloy,etc. Welding diamond/carbide saw blade, diamond cutting tools, grinding tools and drilling welding. Carbide cutting tools for machining welding. Such as turning and milling cutter welding. Mining tools welding, such as pillar gear drill bits, dovetail coal drill bits, drill rods riveting, all kinds of shearer. The welding of wood working tools, such as woodworking planer, milling and drill. Hot forming for all kinds of standard parts, fasteners, machinery parts, hardware tools and straight shank twist drill. 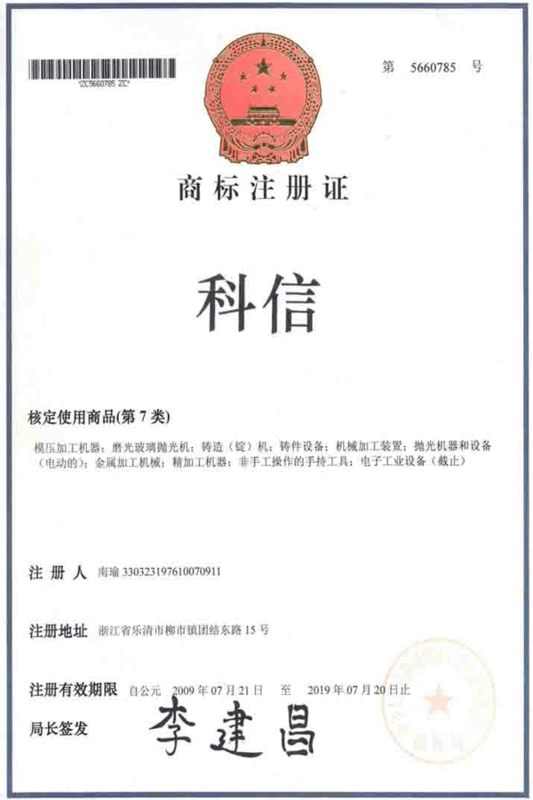 Metal annealing, such as: tensile steel; wire, nail wire heating and stainless steel annealed. The heating method known as induction heating occurs when we pleace an electrically conductive material in a varying magnetic field. So induction heating is a rapid form of heating. Its current is induced directly into the heated par. Also induction heating is a non-contact form of heating. Can you braze glass or ceramics with induction? If you work with glass or ceramics, a compact vacuum furnace is a great solution for brazing. You’ll get quick, clean heat with very precise temperature control. What makes up a typical induction heating system? A typical induction heating system consists of the induction heating power supply, an induction heating coil and a water-cooling source and several internal components inside the power supply. 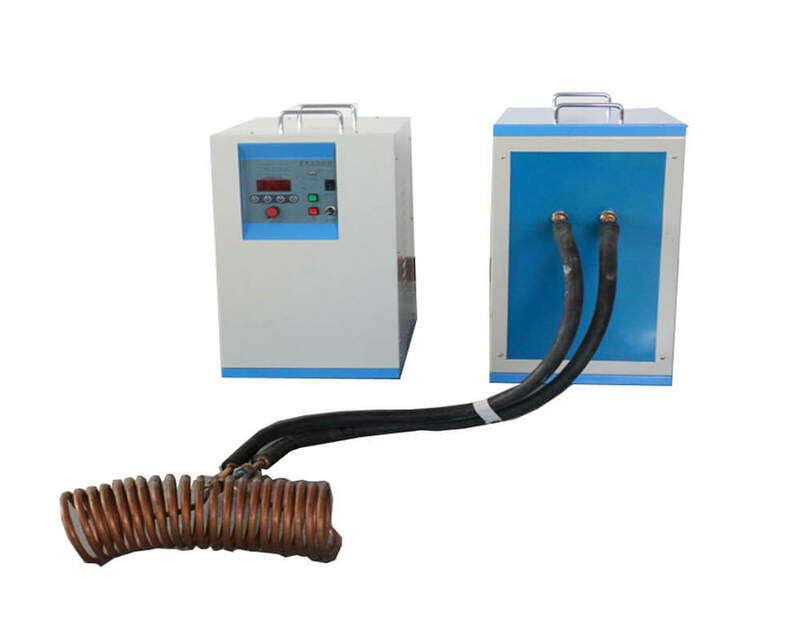 The induction heating power supply sends alternating current through the induction coil, thus generating a magnetic field. Hence place a work piece within the coil and enters the magnetic field, then it induces eddy currents within the workpiece. Furtherly it’s generating precise and localized heat without any physical contact between the induction coil and the work piece. Will induction heating increase my utility bills? Not likely. Induction heating is a very effective, efficient means of heating. Most of our customers who are switching to induction for the first time see their utility bills go down. What are typical utility requirements for induction? Of course it depends on the system, but a typical typical system requires 380, 3-phase VAC at 50 Hz and 30 Amps. Also figure on 80 PSI compressed air and 40 PSI water at 4 gallons per minute for cooling. Is this joint suitable for induction brazing? Our team of metallurgical and mechanical engineers will be glad to have a look at your parts and process and give you our best advice – no obligation! How can my process benefit from induction heating? It can benefit your process in a number of ways. Induction heating is highly repetitive once making the initial adjustments to the power supply. Following this phase, it will heat part after part with identical results so long as introduces the parts to the coil similarly each cycle. This can also lead to better material utilization and product yield. Induction heating can reduce or eliminate the need for skilled operators in application such as brazing and soldering. The ability of induction heating to heat all parts identically lends itself to automation of the process. Induction heating can also heat the part in a highly localized fashion. It can be extremely beneficial when it is desirable or necessary to limit the heat to only a certain region of the part. What are some of the other advantages to using Induction Heating? Fast Cycle Times – With induction heating technology, it produces heat instantly and directly within the heated part. Thus it supplies heat as quickly as a material will permit it, eliminating typical soak times associated with radiation or convection heat technologies. Accurate Heat Zones – It can also isolate or pinpoint a heat-zone and small or large without affecting surrounding areas. So the result is minimal distortion in part being heated and yielding higher quality production. Furthermore, additional infrared temperature control devices can also be added for further control of a process. Consistent and Repeatable – Due to the development of Solid-State power supplies, the heating pattern produced by a given induction coil will be consistent from day to day, month to month. The process will remain repeatable, rather than traditional flame heating or resistance heating having constantly changing characteristics. Space Requirements and Efficiency – Due to the smaller space requirements for induction heating, this technology lends itself to bench-top/work cell environments and in-line semi or fully automated processes. In addition Induction Heating technology is energy efficient. And power consumption to create the output power is minimal and in idle. 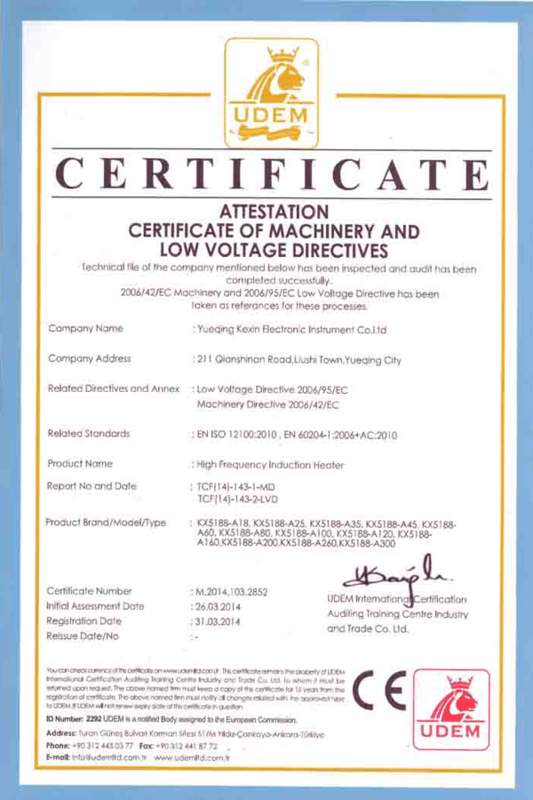 Besides, stand-by conditions power consumption is greatly reduced since the power is only on when utilizes the system for the intended process. Environmentally Friendly – Induction heating is an extremely clean heat. Also it does not produce harmful emissions or loud noise. Furhter more, it does not heat the environment or area outside the work coil, since it only generate the heat in the heated work piece. Thus induction heating assists in creating more favorable working conditions. How hot does the induction coil get? The induction coil is cool to the touch and the heat that builds up in the coil is constantly cooled with circulating water. Can you use induction heating to braze steel parts in a nitrogen atmosphere? Yes you can, but the nitrogen has to be clean and have a low dew point. Can diamond bits be brazed with induction heating? Sure, in fact induction heating is preferable for diamonds bits because it works so quickly. The longer the diamond remains at heating temperature, the faster it degrades. So we recommend atmospheric brazing in a vacuum atmosphere for the best results. When is it better to use the indirect heat of an induction furnace instead of direct induction heat? Yeah, we get that question a lot. It depends on the geometry of your part and how you want to heat it. If you have a part with simple geometry and your process calls for heating a specific area of the partg. We suggest that direct induction heating will generally be preferable. However, if you need to heat the entire part, or if the part has a complex shape. 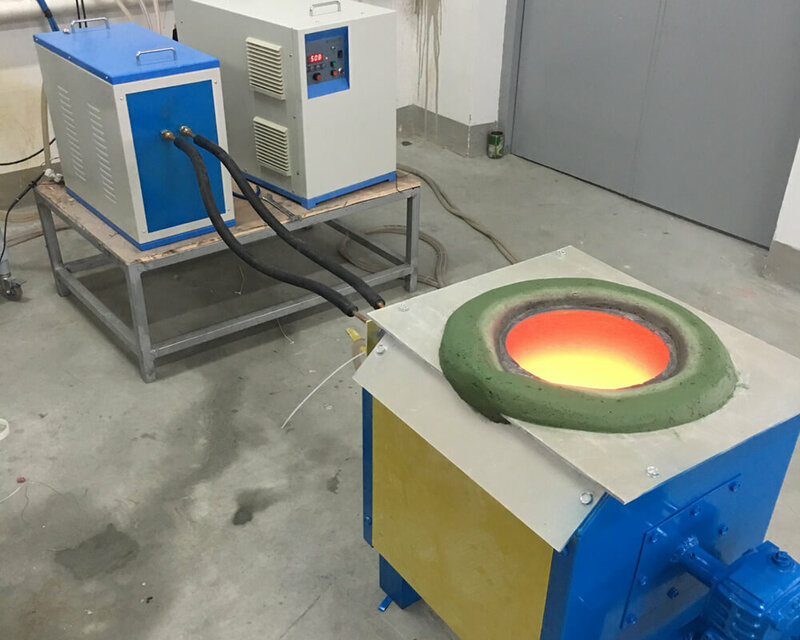 Then you’ll achieve better results with an induction heating vacuum furnace.